Submarines have always been prized for their stealth and surprise. Today that is even truer. The accuracy and lethality of modern cruise (and possibly ballistic, in the case of China) missiles have put any surface combatant without anti-ship missile defenses in real danger. A single missile hit can render even large warships, like destroyers, combat ineffective; and two could sink them, as was demonstrated during the Falklands War. At the same time, modern submarines are relatively expensive. They generally cost more to build than surface ships. They also need crews with longer and more technical training, and they require special shipyard facilities to conduct repairs and maintenance. Of the countries in Southeast Asia, only Indonesia has operated submarines for long. It acquired its first submarines in the 1950s. Its last real attempt to modernize its submarine fleet was in 1997, when it bought two retired German Type 206 submarines that it intended to refit. But the Asian Financial Crisis scuttled that plan. In the same year, Vietnam purchased its first submarines—two eleven-man midget submarines, primarily as diver platforms, from North Korea. Singapore ordered its first submarines at about that time too, contributing to Malaysia’s decision to do the same a half decade later. The latest wave of submarine procurement began in 2009 with Vietnam’s decision to buy Kilo-class submarines from Russia. That was followed by announcements from Indonesia, Thailand, and the Philippines that they would also acquire new submarines. This time, however, their pursuit of submarines had been driven by their recognition of the importance of open sea lanes to their economies and their growing concern over China’s military rise and its assertiveness in territorial disputes in the South China Sea. Those factors also prompted a concurrent rise in Southeast Asia’s acquisition of patrol boats to monitor the waters of the South China Sea, but such boats would be no match for the modern warships of the Chinese navy. And so, the region turned to submarines, which can serve as platforms for not only torpedoes, but also underwater-launched anti-ship cruise missiles. Since China’s anti-submarine warfare capabilities have lagged behind its other naval combat competencies, some regional navies have seen submarines as a way to gain advantage. For all the procurement (actual and intended) of submarines in Southeast Asia, it is unlikely that any of the region’s navies could balance the power of China’s, which added at least 14 new submarines and 21 new major surface combatants since 2009. Certainly, Southeast Asia’s submarine forces, acting alone, would be hard pressed to temper China’s activities in the South China Sea or lead it into serious multilateral negotiations over its claims there. Even Vietnam’s fleet of six Kilo-class submarines, which once completed will be among Southeast Asia’s largest, would have trouble countering China’s South Sea Fleet. Had China the political will, it could augment its South Sea Fleet forces with those of its other two fleets and replace losses with new production from its shipyards. Vietnam could not. Unlike ground warfare, at which Vietnam has proven formidable, naval warfare today requires sophisticated combat platforms, sensors, and weapon systems to prevail. While Vietnam’s submarines may achieve sea denial in some areas of the South China Sea, they are unlikely to score a decisive victory. The submarines of other Southeast Asian countries would probably fare no better. Malaysia’s two Scorpène-class submarines and the Philippines’ hoped-for three submarines would be at an even greater disadvantage than Vietnam’s. Only Indonesia’s envisioned buildup of 12 submarines (and the concurrent development of its submarine shipbuilding and repair capabilities) would stand a reasonable chance of balancing Chinese naval power in the South China Sea, given the country’s greater strategic depth from frontline Chinese air and naval bases. But Indonesia has yet to approve the acquisition of a second batch of six submarines, and has so far been hesitant to directly challenge China’s claims in the way that the Philippines and Vietnam have. However, if Vietnam’s submarines were to operate in concert with the country’s other weapon systems—notably its 36 Su-30MK2 fighters, two batteries of P-800 mobile land-based anti-ship cruise missiles (part of the K-300P Bastion-P coastal defense system), six Svetlyak-class fast-attack craft, and four Gepard-class frigates—Vietnam would be better positioned to turn any attempt by China to enforce its claims in the South China Sea into a more costly one. But before Vietnam can do that, it will have to field a better maritime surveillance system to detect and target ships at sea as well as develop a joint command and control network to coordinate its forces. Neither task is trivial. The Philippines is in the process of deploying a coastal radar system (partly funded by the United States) to improve its maritime domain awareness, but it has few other resources to support any submarine force that it might deploy. Its navy has just begun to equip itself with warships capable of being armed with anti-ship cruise missiles. Its air force has ordered a dozen FA-50 light multirole fighters, which can launch cruise missiles, but no such missiles have yet been procured for them. In any case, the fighters would find it difficult to operate for long over the disputed waters near the Spratly Islands from their likely base on Luzon. At least the Philippine navy could benefit from its new base at Ulugan Bay on the western coast of Palawan Island. Even with other elements of their armed forces supporting them, the submarines of individual Southeast Asian countries lack the numbers and breadth of capabilities to balance China’s naval power. Closer military cooperation among the region’s countries is one possible remedy. In the past, mutual distrust among those countries has prevented that from happening, but China’s recent assertiveness has pushed the Philippines and Vietnam close enough together that they have begun to share intelligence and conduct naval exchanges.4 Should the two countries complete their submarine acquisitions and turn their military cooperation into full-fledged coordination, the Chinese navy may find the South China Sea a bit more confined, with Philippine submarines to the east and Vietnamese ones to the west. A few officials have even voiced their support for greater military cooperation across ASEAN.5 Certainly, the addition of Indonesia and Singapore’s planned submarines would benefit Southeast Asia’s side of the naval balance. 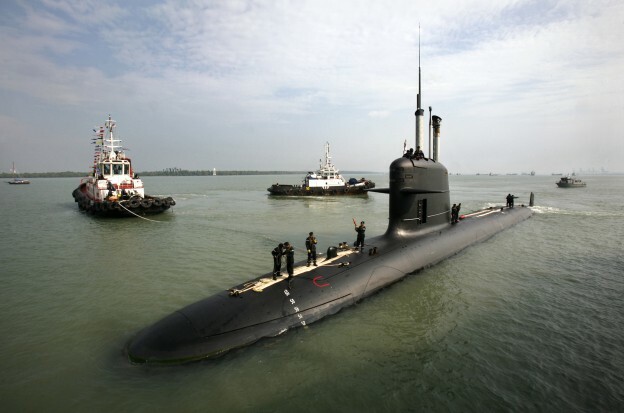 If completed, Indonesia’s 12 submarines would be the largest submarine fleet in the region. Singapore’s submarines—equipped with air-independent propulsion systems that enable them to operate underwater for long periods—are already the region’s most capable. In November 2013, Singapore announced that it would acquire two even more advanced Type 218SG submarines from Germany.6 They could pose a serious challenge to the Chinese navy. Fortunately for China, the possibility that ASEAN will become some sort of defense community seems low. Despite an uptick in the region’s defense industry collaboration, ASEAN remains a loose confederation, not a proto-alliance. ASEAN’s launch of its economic community this year will not change that. Besides, China already appears to be at work drawing some ASEAN countries—Cambodia, Laos, and most recently Thailand—closer into its orbit with lures of economic development aid. The countries of Southeast Asia have clearly not been alone in procuring submarines. Across Asia, others have been busily either acquiring or making plans to acquire them, including Australia, China, India, Japan, South Korea, Taiwan, and even Bangladesh. Submarines have proliferated, largely because they are now a natural part of any navy’s modernization, given the realities of modern naval warfare. In the context of the South China Sea and in the numbers that Southeast Asian countries are currently acquiring them, submarines are unlikely to soon alter the maritime balance in the region without better integration with other national defense assets and greater cooperation between countries. 1. Purchased from Sweden, these submarines were formerly the Västergötland-class and Sjöormen-class, respectively. 2. Wassana Nanuam, “PM puts hurry up on defence budgets,” Bangkok Post, January 2, 2015, http://www.bangkokpost.com/print/453695; Carmela Fonbuena, “PH Navy’s goal: At least 3 submarines,” Rappler, December 17, 2014, http://www.rappler.com/nation/78243-philippine-navy-submarine; Jon Grevatt, “Royal Thai Navy launches submarine squadron,” Jane’s Defence Weekly, July 7, 2014; James Goldrick, “Reality check: Indonesia’s submarine ambitions still a long shot,” Jane’s Defence Weekly, July 31, 2013. 3. Dzirhan Mahadzir, “RMAF to move Hawks to East Malaysian airbase,” Jane’s Defence Weekly, November, 23, 2014. 4. Manuel Mogato, “Vietnam warships visit Philippines amid South China Sea dispute,” Reuters, November 24m 2014. 5. Frega Ferdinand Wenas Inkiriwang, “Are ASEAN militaries ready to cooperate?” Jakarta Post, July 7, 2014. 6. Tom Kaeckenhoff and Maria Sheahan, “ThyssenKrupp wins submarine order from Singapore,” Reuters, December 2, 2013. Good Analytical report. However, my take is that in hostilities or a war, the likelihood of an outright winner is difficult bordering on being a fallacy. It has been proven before e.g. Nazi Germany U-boats etc. that were countered by the American improved anti-submarine depth charges; the British success in breaking the U-Boat codes etc. A nation can try to build a better “boat/s”, BUT others will find ways to counter with advanced high-tech capabilities. Better to spend the money improving infrastructures of individual countries concerned; and with surpluses, help the unfortunate people in war-torn countries & feed the poor HUNGRY KIDS.